Today Antutu reveals our list of the global top 10 best performing Android phones for March 2019. With many new models powered by Snapdragon 855 going on sale in the past month, the performance ranking for March has been totally rewritten compared to that of February. Is your phone on the list? Come and check with us. 2. Period of data collection: March 1, 2019 to March 31, 2019. 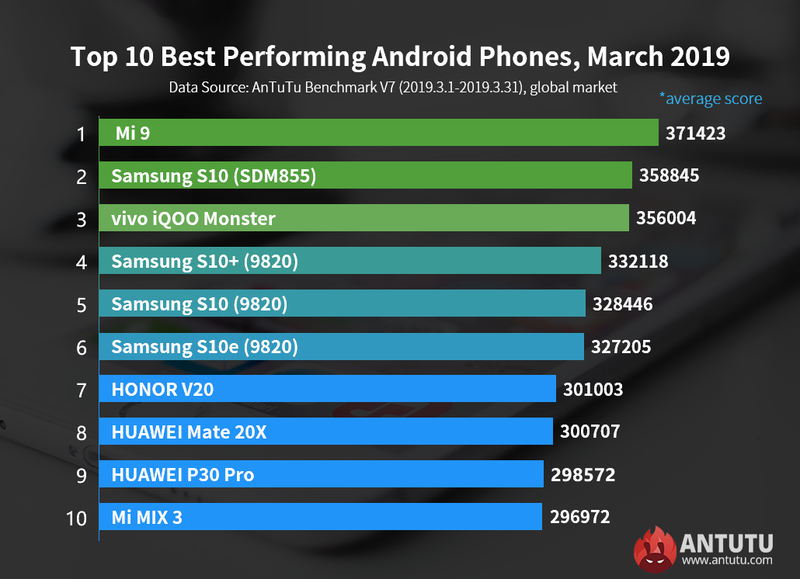 In March, the first spot is taken by Xiaomi’s recently launched flagship, Xiaomi Mi 9, with an average Antutu score of 371,423 points. The phone is powered by Snapdragon 855 chipset and offers up to 8GB of RAM. Coming in second is Samsung S10 (SDM855), which scored 358,845 points. Samsung S10 (SDM855) shares the same Snapdragon 855 chipset with Xiaomi Mi 9, but its CPU scheduling is less aggressive than that of Xiaomi Mi 9, which can enable the running of eight CPU cores at full load for longer amount of time, although at the cost of more power consumption. The third spot goes to vivo iQOO Monster, which gets an average Antutu score of 356, 004 points. It is also powered by Snapdragon 855 chipset with 12GB of RAM. Its CPU scheduling is relatively conservative with a bias towards battery life compared to that of Mi 9. The next three positions are occupied by the Samsung S10 series, which in order are Samsung S10+, S10 and S10e (9820) with an average Antutu score of 332118, 328,446 and 327,205 points respectively. All the three phones are powered by Samsung’s latest flagship chipset, the Exynos 9820, which offers a 20% boost in performance and 40% increase in power efficiency compared to the Exynos 9810. Ranking at No.7, No,8 and No.9 are the Kirin 980 powered HONOR V2, HUAWEI Mate 20X and HUAWEI P30 Pro, with an average Antutu score of 301,003, 300,707 and 298,572 points respectively. Kirin 980 is built on a 7nm process, with a CPU clock speed of up to 2.8GHz. Although Huawei P30 Pro is a newly launched model, its major selling point lies in its camera performance. Mi MIX 3, powered by Snapdragon 845 chipset, secured the last spot with an average Antutu score of 296,972 points. From the above ranking chart, we can see that Mi MIX3 is the only Snapdragon 845-powered smartphone listed among the top 10. With more Snapdragon 855 devices entering the list in the coming months, Snapdragon 845 devices will be gradually squeezed out of the top 10 list.